Free Ground shipping on retail website orders of $150.00 or more shipping within the U.S. 48 continental states*. Alaska, Hawaii and other U.S. Territories do not qualify for free shipping. It is the responsibility of the customer to select the free shipping option once the order qualifies. Failure to do so will not result in shipping charges being returned. Free Ground shipping rates will not be applied to other shipping options, e.g. Next day Air, 2day or 3 day. *Paid, Retail orders only, No Wholesale orders. *Free shipping does not apply to gift cards redeemed orders. *Free Shipping does not apply to ARB bumpers, refrigerators, tents or roof racks. Orders received after 11:30 am PDT for expedited shipping will not ship until the following business day. Orders placed on weekends will be processed on the next following business day. Orders are processed first come, first served. Would you like to take control of your package delivery? 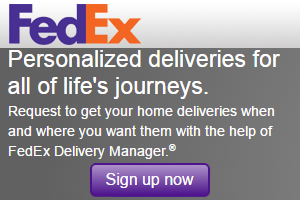 Now you can with FedEx Delivery Manager! Review your order upon arrival. This simple step can save you time and money. For questions about our return process or to request an RGA, please call (866) 349-6801.